Thank you to all of you who took my reader survey. If you haven't I'd love for you to take it--it's short and sweet, and will help me give you more of what you want to see. Thanks! I’ve talked a lot about wardrobe staples recently, and I’ve come to learn that there isn’t truly a “universal list” of staples that work for everyone. Sometimes I buy something (like my black ponte pants) and know they’ll get a ton of wear, other items evolve more gradually into “staple” status. 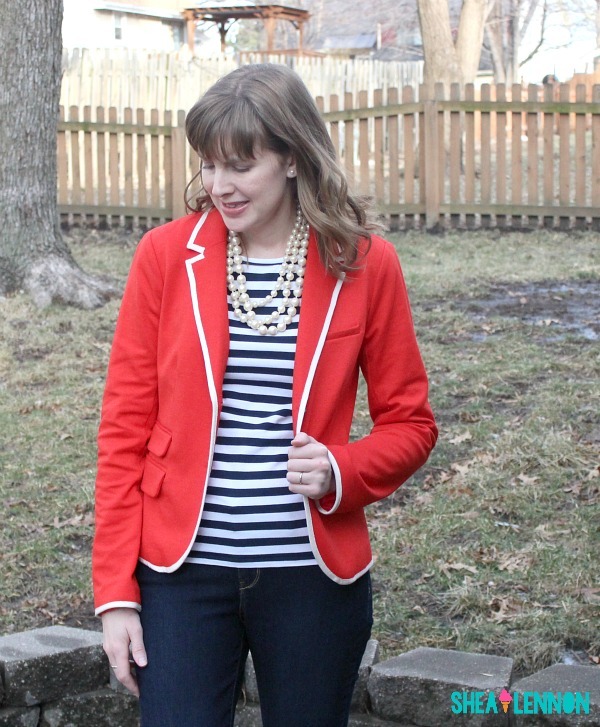 For example, I bought an orange blazer from Target a few years ago (seen here, here, and here) because it was on major sale. 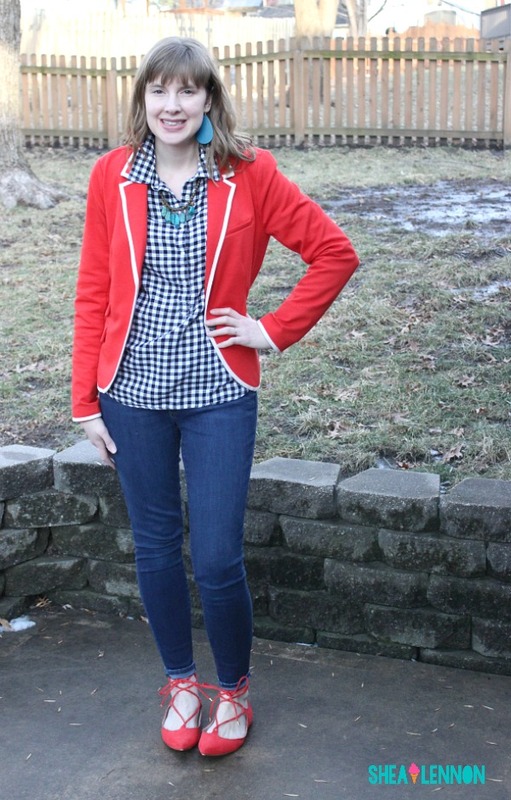 Some impulse buys don’t work out for me, but as evidenced by my blog, I wore the heck out of that blazer. Therefore, when it started to show signs of wear I knew it would be necessary to find its replacement, stat. 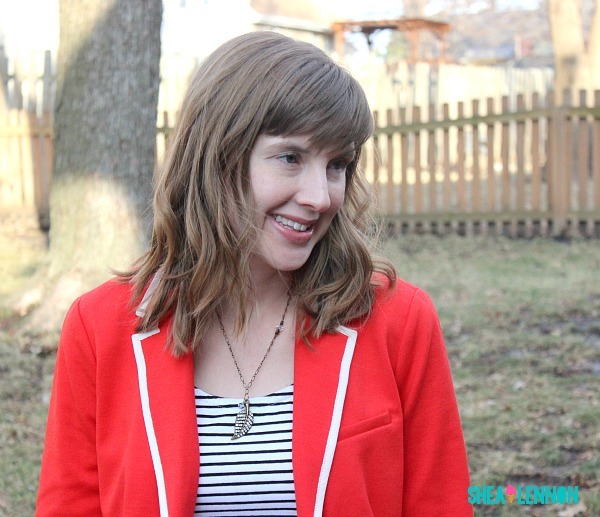 I like to focus more on quality when I’m buying staples, so I looked to my favorite place to buy quality brands at a low cost, ThredUp. 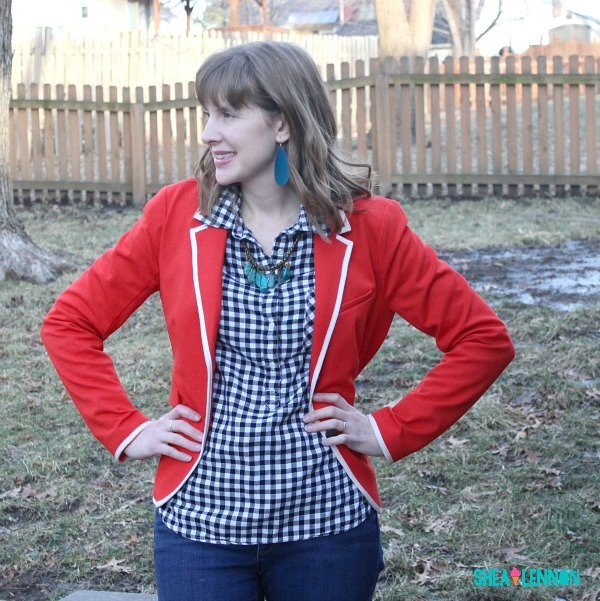 I found this tomato red Gap blazer in near-perfect condition and happily put it in my shopping cart. 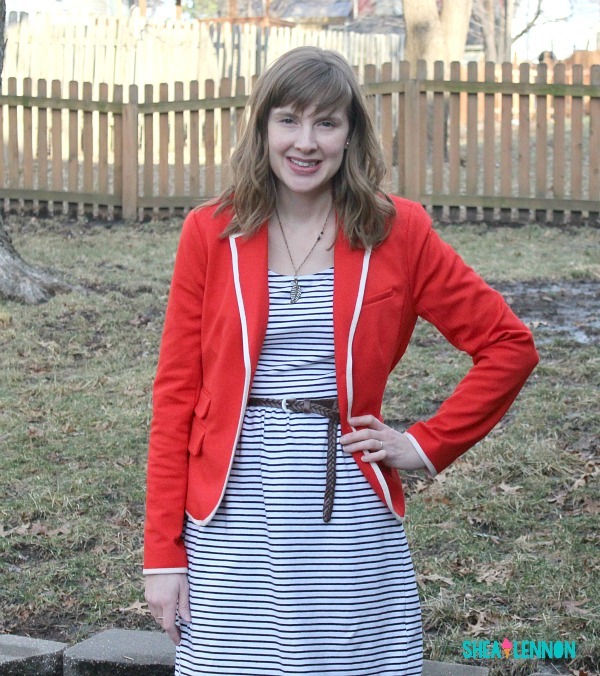 I’m thrilled with the quality and have found it to be just as versatile as it’s orange, worn counterpart. 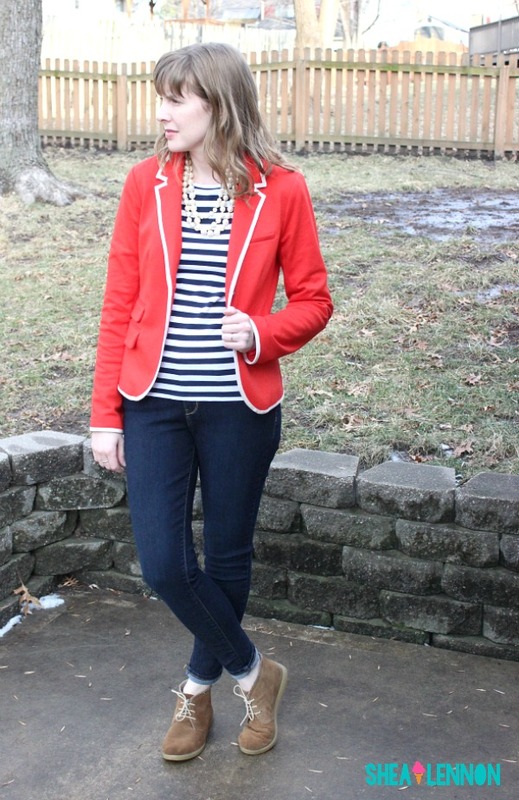 This bold blazer is the perfect topper to a striped dress. 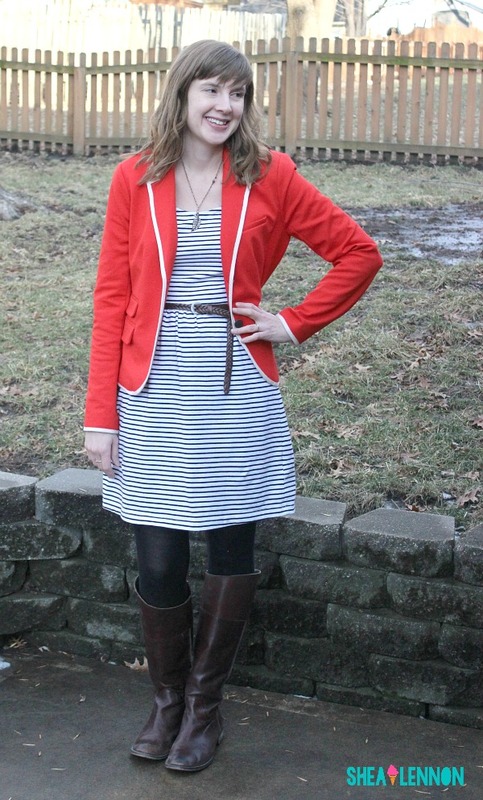 I kept the rest of the look neutral, with black tights and a brown belt and boots. By the way, I’m a big fan of mixing neutrals, like black and brown, especially when you have a bright pop of color somewhere else in your outfit. Sometimes in the winter I get stuck in a neutral rut, but I’ve mentioned before that I want to embrace color more often; it truly does make me so happy. I’m keeping my base layers neutral: black and white checks with denim. 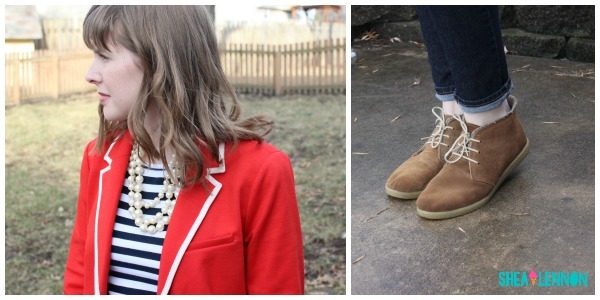 On top, however, I incorporated the tomato red color in both my blazer and my shoes. 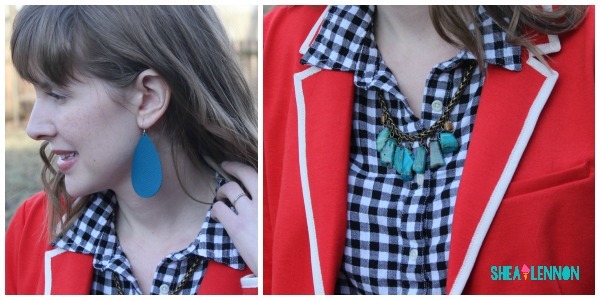 For even more color I did smaller pops of turquoise in my necklace and earrings (both from KC locals, woop woop!). 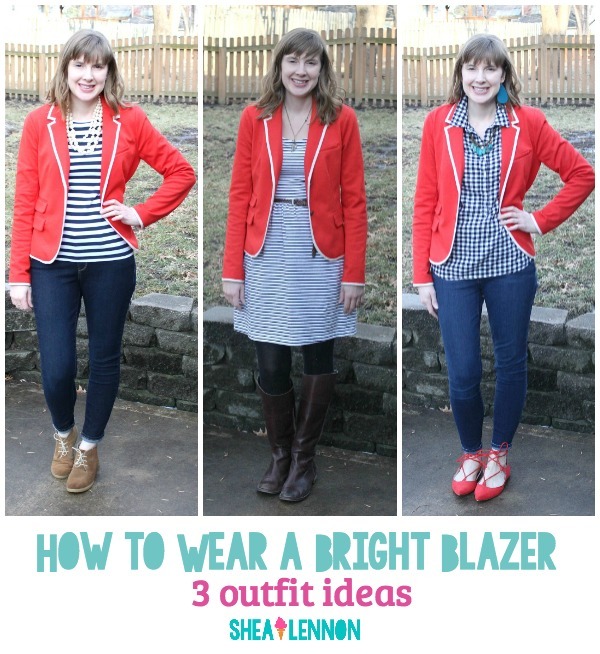 Do you have a bright blazer in your closet? How do you like to wear it? 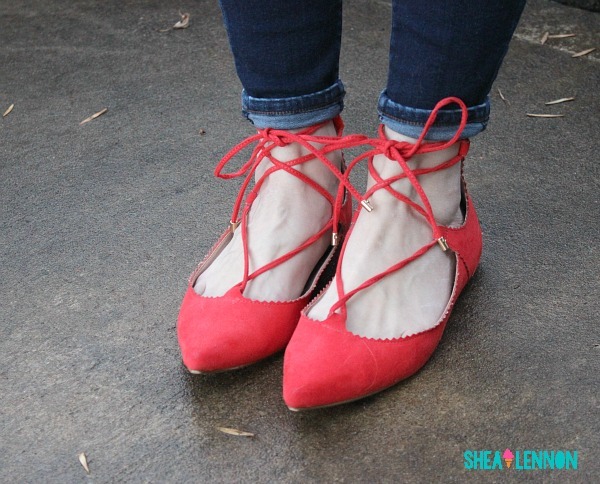 Linking with Mix it Mondays, Hello Monday, A Lovely Little a la Mode, Let it Shine, Bloggers Who Have Inspired Me, Confident Twosday, On Trend Tuesdays, Oh Hey Girl, and Thursday Fashion Files.